You already know what your book is going to be about. You’ve spent years thinking about it, and developing your specialized knowledge. The time consuming part is to get what’s in your head out on paper where it can start spreading your idea, helping potential customers and generating leads. Step 1: We have a 30 minute strategy call to go over your content, work on a great title and create the outline for the main call that will start a conversation and guide readers toward the next step. Step 2: We record a 60 minute podcast-style audio interview where you get to talk about your ideas in a comfortable way that draws out your best thinking and makes it easy to fully express all your ideas. Finally we format your book in a professional layout and deliver 10 copies for you to share. Most importantly, we create a landing page template to deliver a digital copy of your book (just like the one that brought you here), so you can start collecting leads straight away. This is the greatest lead generation tool you'll ever own and the 90-Minute Book program is designed to get your book printed and collecting leads as soon as possible. But that's not all. 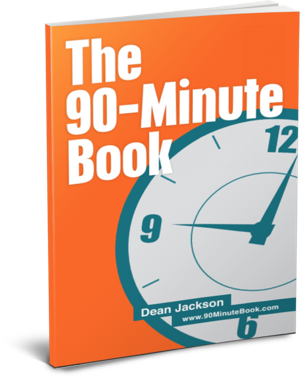 Your 90-Minute Book is supported by a free 30 day trial of GoGoClients, the simple way to create additional landing pages, toll free voice mail hotlines, text-to-join tools and email campaigns to engage customers in a conversation that educates and motivates them toward doing business with you. Request additional copies of your book. after this time we can offer additional support/services should you need them. It really is the easiest way for you to create a book in 90 minutes and is the exact process we used for this 90-Minute Book. To start your 90-Minute Book today, just click the 'Start My Book!' button and we'll take it from there!